From the popular anime series "Kemono Friends" comes a Nendoroid of "Arai-san", the common raccoon! She comes with three face plates including a confident smiling face, a searching expression for when she is desperately searching about as well as a despondent expression! A large selection of hand and arm parts are included to capture her various poses from the series, and she also comes with her "treasure", Kaban-chan's hat! 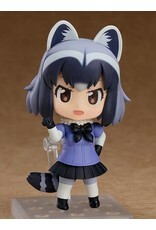 Be sure to display her together with the other Nendoroid friends from the series, including the upcoming Nendoroid Fennec Fox!